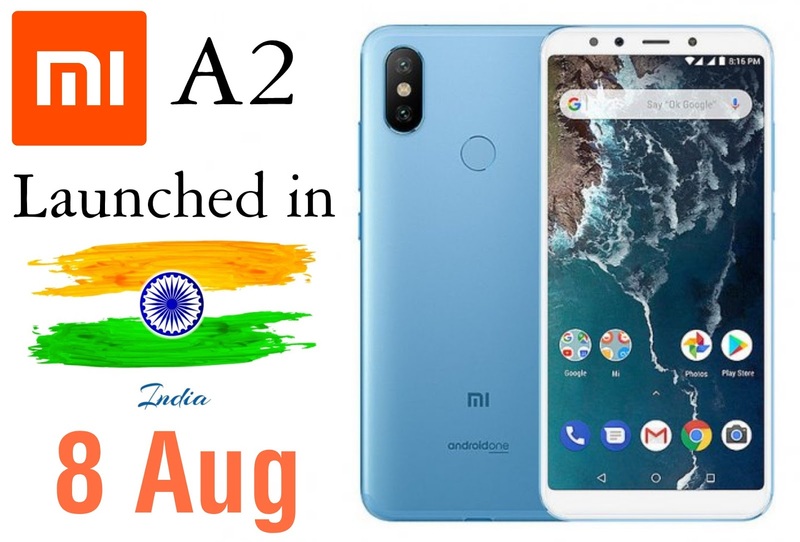 Mi A2 launched in India : As you all know, Xiaomi was going to launch Mi A2 in India on 8 Aug, And today Xiaomi has launched Mi A2 on the scheduled time. As it is launched officially, All of its features are confirmed now. And today I am going to tell you about all of its features. Mi A1 was a very great smartphone and Mi A2 is the successor of this smartphone. I am curious to see How Mi A2 will perform in Indian market. I like the Stock android experience in Xiaomi's Smartphones because Xiaomi launches smartphone in an affordable price and Xiaomi never sells a over-priced smartphone with worst features, Mi samrtphones always have great features according to their price. Mi A2 also has very great features in such a cheap price. It is launched in India for Rs.16,999 for 4+64GB variant and it's 6+128GB variant is coming soon in India. It will be sold via Mi.com and Amazon in India. You can Pre-Order it on 9 Aug, 2018 12 noon. The 1st sale will be on 16 Aug, 2018 12 noon. So, Let's look at the features of Mi A2. Mi A2 comes with 5'99" Full HD+ IPS LCD Display which is protected by Corning Gorilla Glass 5. It has two RAM variants, one variant comes with 4GB of RAM and 64GB of Internal Storage, and the Second variant comes with 6GB of RAM and 128GB of Internal Storage. Mi A2 is powered by Snapdragon 660 SoC which is 2.2Ghz Octa-Core processor and it comes with Adreno 512 GPU. It is a very good processor and its speed is very fast. This processor is best for mid-range smartphones. This phone comes with a 12+20MP Dual-Camera setup with EIS on the back side, Both camera's aperture is f/1.75 and they can record video upto 2160p@30fps (4K@30fps) and Dual-LED flash is given alongside the camera. There is a camera of 20MP given on the front side of the phone and this camera comes with an aperture of f/2.2 and it also comes with an LED Flash. As it is a Xiaomi Phone, It comes with an IR Blaster at the Top. It has Bluetooth 5.0 and it comes with a USB Type-C 1.0 reversible connector. Mi A2 has Fingerprint sensor on the back and it also has Accelerometer, Gyro, Proximity and Compass sensor. It supports Qualcomm Quick Charge 4.0 only in Indian variant and In other countries variant it supports Quick Charge 3.0. It has 3000mAh Non-Removable Battery. So these were the great features of Mi A2. Did you like Mi A2 features ? Please share your thoughts via Comment.